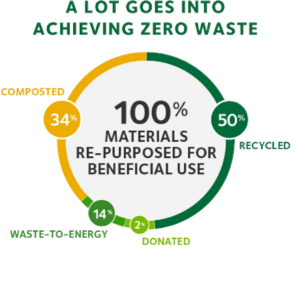 100% of all tournament materials diverted from the landfill. Three Zero Waste Stations, repurposed 40-cubic yard roll-off dumpsters transformed into eye-catching kiosks with an interactive game, teach fans how to recycle and compost. All materials brought on site must be locally reused, recycled, or composted.